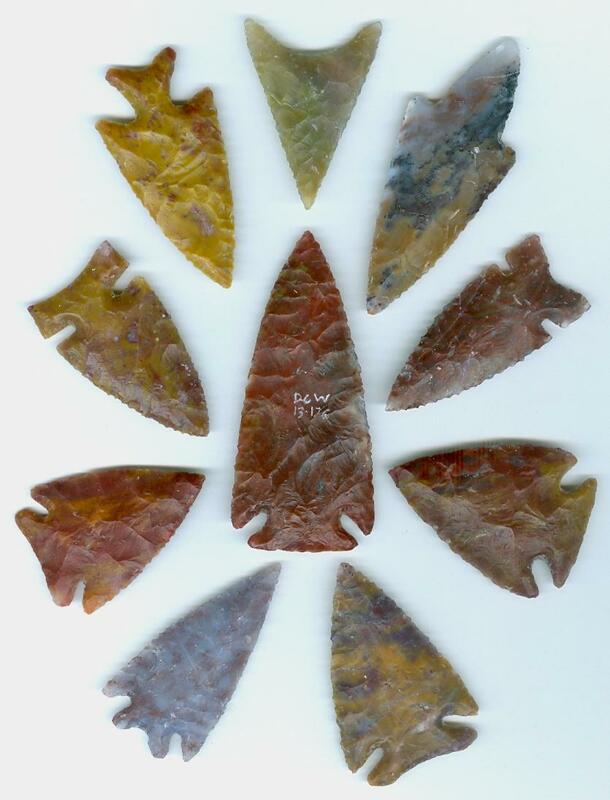 Welcome to Flint Jack’s Gallery featuring museum quality replicas of prehistoric flint projectile points, knives, and daggers made by master knapper D.C. Waldorf. All pieces are one-of-a-kind, with the correct scar patterns for the type, and are chipped as clean as possible. If there are any minor flaws in the material or workmanship it will be noted in the description. The images, whether scans or photos, are not shown in scale relative to one another as in the old gallery so for size you must pay attention to the dimensions listed for that particular piece. Specimens are permanently marked using an electric vibrating engraver with the initials “DCW” or “W” followed by the year date as well as a serial number for that year on the larger pieces. Daggers have been numbered sequentially from D-1 in 1983 to the present 500+. The Axe series stared the same year and have an "A" prefix. In the categories below the "Flint Jack's Gallery" heading in the sidebar you will find that which is currently in stock. For the most part, specimens are listed in chronological order starting with "Paleo Points" through "Archaic Points," "Woodland Points," and "Late Period Points." The "All Over 4" page features larger points at reasonable prices. "Foreign Lithics" features points from Great Britain and Northwest Europe, and my daggers are listed on their own page under "Danish Daggers" Remember, the gallery is regularly updated as items are sold and replaced so be sure to check back often. For customers using the shopping cart feature and paying with Pay Pal or credit card, flint work can be purchased immediately and will be shipped the next day in the same parcel along with other items, if there are any. If you are ordering by mail, paying with a check or money order, flint work must be “reserved” first to make sure it is available when payment is received. In this case, take note of the serial numbers and e-mail rocky1@arkansas.net or call 417-546-5125 between 12 and 6 PM Central Standard Time to reserve pieces for 10 days. If there is something you would like custom made that is not on the list, please inquire at the address above.